Judgment is Coming. It's almost time. Obey the law, or else you will be judged and sentenced immediately. Arriving in theaters this week is Dredd 3D, starring Karl Urban as the new Judge Dredd. I'll be there, seeing this film again, because it's so awesome. Entertainment Weekly has posted the latest Mondo poster designed by artist Jock (@jock4twenty) for Dredd, being revealed and sold at Fantastic Fest this week as part of the film's final premiere at the fest. I think it's simplistically bold, and badass, and I would like to get my hands on one somehow. View the full-size Jock Dredd print below. And go see Dredd 3D this weekend! Dredd takes us to the wild streets of Mega City One, the lone oasis of quasi-civilization on Cursed Earth. Judge Dredd (Karl Urban) is the most feared of elite Street Judges, with the power to enforce the law, sentence offenders and execute them on the spot – if necessary. The endlessly inventive mind of writer Alex Garland and the frenetic vision of director Peter Travis bring Dredd to life as a futuristic neo-noir action movie that returns the celebrated character to the dark, visceral incarnation from John Wagner and Carlos Ezquerra's revered 2000 AD comic strip. 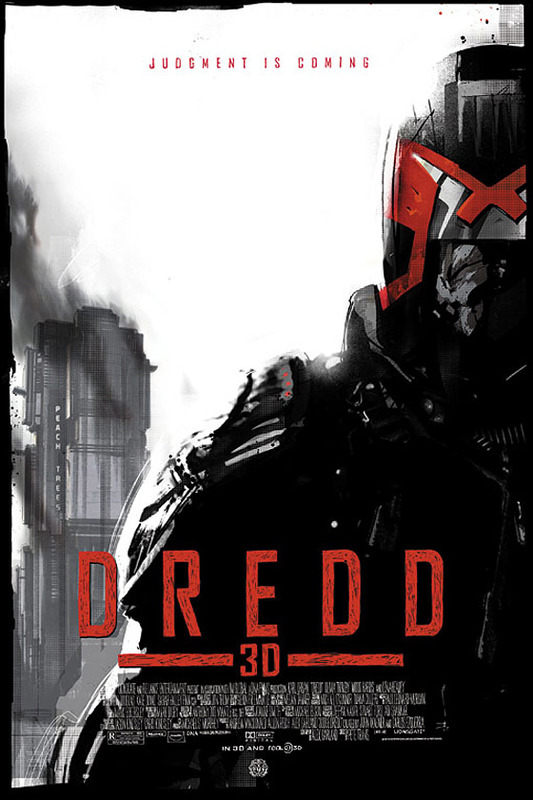 Dredd 3D is set for release everywhere starting September 21st. Cool, if not slightly pedestrian for Mondo. Oooh. If I were a better artist, I would accept your challenge. But the helmet is so iconic! Could have done the shoulders? They are just as Iconic. Also his bike? Or even MegaCity itself, that is the biggest character in the story. I always liked Dredd, I liked that you couldn't see his face. Yeah, or incorporated the "slo-mo" in some way would have been cool too. i love karl urban, but am i only the only person who has a problem with his really forced "stallone" frown?? ...the frown is Dredd, Stallone was just doing the same impersonation. "Dredd, Judge Dredd." Kinda anxious to hear that in the movie though. Is this a remake or an original story? Props to those who are behind in the making the movie, hope to get that box office numbers growing.